30 September 2018 – Savannah Jazz Band: This is such a great band and a joy to listen to. My all time favourite is the deadpan presentation of jokes by reedsman Roger Myerscough. 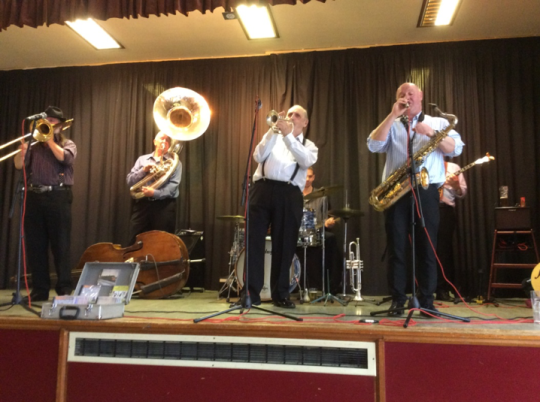 Other members of the band are: Bill Smith (leader) on trumpet, harmonica and vocals, Dave Morrell on trombone, Tony Pollitt on double bass, John Meehan on drums and Chris Marney on banjo. The music was an exhilarating mix of blues, marches and jazz so there was something for everyone. “Move Your Body Over”, “My Gal Sal”, “Beedlum Bum” (just don’t ask!! ), “Walking with the King, "The Dallas Blues” to the final “Going Home”, to name but a few, were all well received. 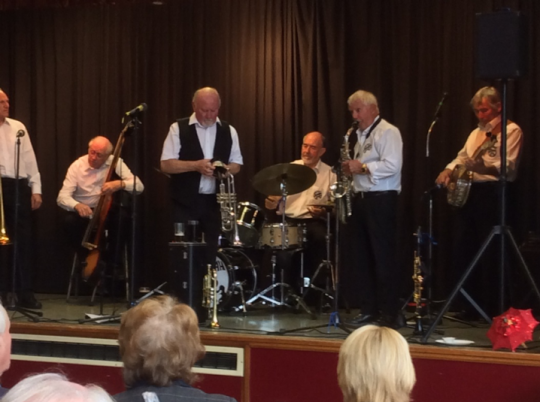 23 September 2018 – Kevin Grenfell’s Jazz Giants: Always lovely to have a visit from this versatile group and this time we had an additional treat in the shape of Jeremy Huggett on reeds. Kevin was his usual jokey self, on trombone and trumpet, Jack Cotterill on drums, Federico Leonori on double bass and Ian Parry on guitar and banjo all played some pretty good jazz. The session included the likes of “New Orleans”, “It’s a Sin to Tell a Lie”, “Some Day You’ll be Sorry” and “Swing that Music” and finished with “Bye Bye Blackbird”. The group received a standing ovation from more than half of the room. 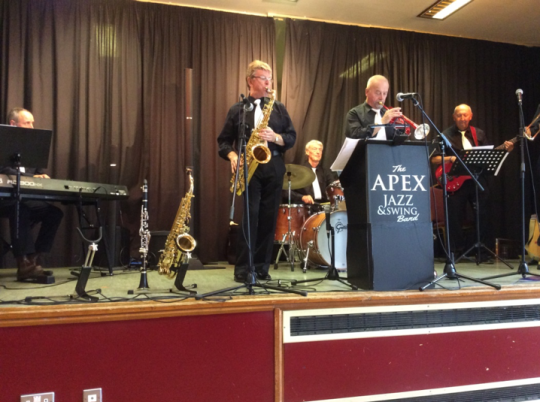 9 September 2018 – Matt Palmer’s Eagle Jazz Band: This band is an old favourite of Stafford Jazz Society. Matt Palmer leading on reeds, Baby Jools on drums (a rare treat), Mike Owen on trombone, Pete Brown on Trumpet, Brian Lawrence on double bass and sousaphone and lastly Brian Mellor on guitar and Banjo. A good mix of music and a good bit of singing from Matt through numbers like “I Ain’t Gonna Give Nobody None of my Jelly Rolls” (don’t you just love that title?! ), “You’re Driving Me Crazy”, “Dans La Rue Entibe” and “Yellow Dog Blues”, ending with as always “Bring me Sunshine”. They most surely do. 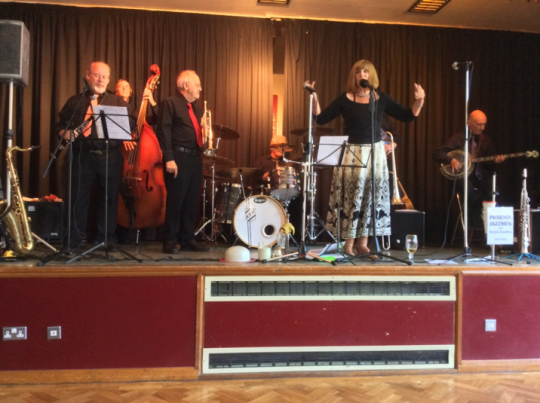 2 September 2018 – Phoenix Jazzmen with Sheila Fawkes: Well, the moment all have been waiting for … the start of the new jazz season. And what a band to open with – winner of the Band of the Year in 2012-13. A room full of enthusiastic jazzers suffering from acute withdrawal symptoms visibly relaxed to the likes of “That’s My Home”, “The Creole Love Call”, “Stevedore Stomp” and “It’s Times Like That”, along with many more. 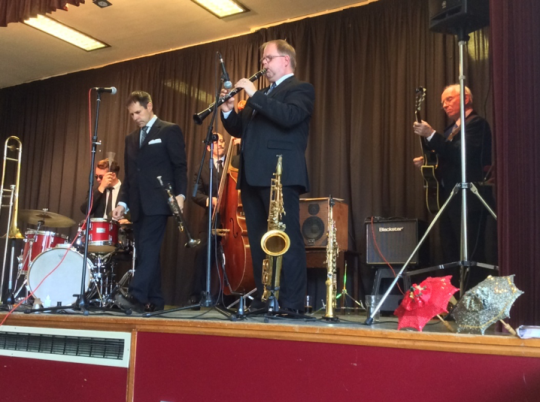 The musicians were the usual suspects: Peter Robinson on guitar & trumpet, Mike Hayler on reeds, Pete Ainge on trumpet, Terry McGrath on trombone, Ken Wright on drums and Mark Johnson on double bass.